When I first started reading this collection I started writing a summary and mini review of each story. I was reading a story between other readings, when I had a small block of time. The file was getting pretty long and I realized that the only one that would read it was me. Fast forward to the end of the collection and I was sorry that there wasn't more. I liked that each story centered on law enforcement heroes and heroines. Often, they are not put in a positive light. The officers are so much more than the negatives portrayed on news. They are amazing, dedicated people with families and hobbies just like the rest of us. To all of the authors that participated, THANK YOU!!! I liked that there was such a variety of stories in Cop Tales. There were so many different types of stories. Small town, cliffhangers, second chance, reunions and series spin offs. The variety of characters was better than an assortment box of Cadbury biscuits. So delicious. I will concede that this anthology is a higher price than a lot of the anthologies that have been published. But if you look at it as just a little over a penny a page, for hours of entertainment, it is a lot of cop for the buck. Most importantly, it goes to an amazing cause, a way of saying thank you. (The authors have posted a pre-order price that I hope everyone will consider. For less than a buck you can get all the stories, hours and hours of entertainment, and so many drool worthy cops.) The Officer Down Memorial Page is a wonderful charity close to my heart. It continues to give recognition to the men and women that chose to protect others. As my late husband, a police sergeant, used to say "gone but never forgotten". Please honor America's fallen law enforcement heroes by purchasing this collection. 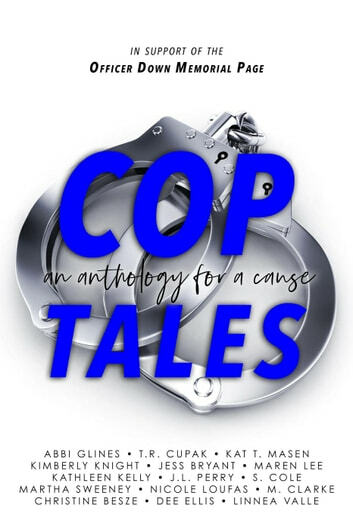 The stories in this anthology are so varied, but at their heart, they all start with a leading character who’s a member of the thin blue line. The stories cover the full spectrum. From laughter to tears, sweet to spicy, there are tales of new love to ones about a second chance at an old love. The only real complaint I have is that there are too many of these fantastic little gems that end in a cliff-hanger for my tastes. It feels a little like I’ve just watched a bunch of season finales and now I have to wait through the hiatus to find out what happens next. The authors have created a very captive audience in me, because I loved what I’ve already read and I’m anxious to devour more. I received a complimentary advanced copy of this book through Buoni Amici Press.